We had been in Rome from March to June with the Trio of Oz/Pino tour and we are now back in Europe about to kick off the 2012 La Grande Madre summer tour with one of Italy’s greatest musicians, Pino Daniele. It is a great thrill for the Trio of Oz to form the core of Pino’s band for this tour. I love Italy and I love Rome and coming here this year, I realize now how important Pino has been in my musical development. I met Pino and Fabiola in 1989 right here in Rome at a Steps Ahead gig in Roma. He was a good friend of Mike Mainieri’s (Steps Ahead band leader). I didn’t speak much to Pino then because I was such a newbie. It was my first jazz tour and he was already a famous rock star. But he was kind to me. Little did I know that eight years later I’d be in his band! It was 1997 when Pino’s bassist Jimmy Earl, called me to join the group. I was thrilled to come to Italy. When we started rehearsals, I knew Pino expected a lot musically since he had performed with Wayne Shorter, Pat Metheney, Chick Corea, and Al Di Meola, just to name a few of the amazing musicians he’d played with. However, it was much more than jazz chops he wanted from the band, he wanted us to connect deeply to his music, and yet he also wanted us to be ourselves while still preserving his ability to deliver the story of the song. You had to be psychic and tasteful in short spurts so as not to step on his vocals or guitar fills. Fortunately, I got the concept fast and we worked well together. The ‘97 tour was a huge pop production and I played Fender Rhodes and Synths. There weren’t too many solos and the stadiums were full (50,000 people and more!). It was my first time on a tour of this magnitude, but Pino was so gracious and I felt as if I belonged. The tour lasted about 6 months and at the end we did a huge show in Napoli and a few great Italian guest artists showed up the rapper Lorenzo, singer Giorgia and Renato Zero. It was an amazing way to start a rock career, to be at such a high level. In between tour dates, we also recorded some tracks for “The Best of Pino Daniele,” which included a grueling session for ‘A Testa in Giu,’ where I had to strike the perfect balance between jazz and pop on a Fender Rhodes. Pino was a stickler for groove and it was a great opportunity for perfecting that side of my playing in the studio. Pino was also interested in my solo career and produced two really nice songs on my GRP CD called ‘Love is The Power.’ At the time, Mike Mainieri was going to introduce Pino to the smooth jazz audience in the USA, but Pino didn’t like airplanes, and taking a boat across the Atlantic took too long, so Pino never made it to America. In 2001, I was playing in Rome with my jazz trio featuring Miriam Sullivan on bass and I invited Pino to hear the group. He loved us and after the show he invited us to play a track on his new CD, which became Medina. He then asked my trio to go on tour with him and we did. It was another six-month tour, which culminated in a SOLD OUT stadium show in Napoli for over 90,000 people. It was an amazing event and a show I’ll never forget. Especially since my dad and his sister came to see several shows that July. They showed up at the gig in TRIESTE – walked past security and they were standing next to Pino who was looking at them like “ummm… Who are you?” I told Pino that was my dad and he was really sweet to him. They got VIP passes and really enjoyed the rock star life! They followed the tour bus in a little Fiat. Very, very cute! Then I did a brief stint in 2002 for the tour with Fiorella Mannoia, Ron, and De Gregori, which was also a lot of fun, but I had to leave early because Peter Gabriel asked me to join his Growing Up world tour, which I did for three years. In 2008, I began playing with drummer extraordinaire Omar Hakim. Omar and I backed Pino and played on his CDBoogie Boogie Man and did several shows with him. And here we are in Rome in 2012, doing yet another wonderful tour with Pino: La Grande Madre. This time the Trio of Oz anchors Pino’s band, comprised of myself, Omar and our bass player, Solomon Dorsey. As many of you know, Omar and I got married in the summer of 2010. We are thrilled to be here in Europe and to play with Pino and perform for all of his fans. I’ve been enjoying the pool at Aquaniene and Fabi introduced me to the Olympic swimmer Massimiliani Rossolino. He was like 7′ tall and such a rock star at the pool. I swam on a team as a kid so it was extra fun to be inspired like that as I return to my childhood dream of being on a world-class swim team. At 5’2″ it is not very easy though! Thanks for getting us to a great place in our career! We get to play great music all the time and it’s because of you all who support us! I won’t quit my day job at the piano;-)!!! Posted July 7th, 2012 in News & Updates. 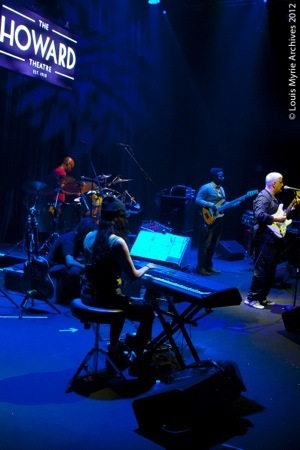 Tagged: omar hakim, Pino daniele, rachel z, Solomon Dorsey.